Designed by Mervin Reid, the Red Creek Lodge is modern but rustic enough to give guests a western feel. With a 24 feet high ceiling, spacious entry, and a long staircase, it is one of the most luxurious ranch resort lodges around. There are large spacious bedrooms and baths—and each room is thermostatically heated by electric heat. Enjoy the full sun deck, an outdoor swimming pool, and a hot tub. To reserve the Red Creek Lodge groups must have a minimum of 25 persons. 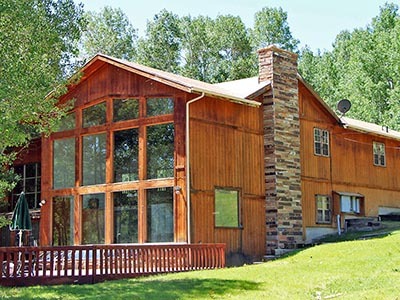 The Red Creek Lodge can accommodate up to 40 people.